Vegan chocolate for your Valentine? Is there anything that shows you care as much as the gift of chocolate? We don’t think so. Seed and Bean contacted us about their range of 22 wild and adventurous flavours of chocolate. So there's plenty of choice to suprise your Valentine with. Go all out for your loved one with a hamper, bursting with colour and taste - or send a special bar of Seed and Bean to tell your bestie you care. Fifteen bars in their range are vegan-certified. Their chocolate bars are crafted with cocoa beans from some of the world’s finest Fairtrade cocoa producing regions. Combined with a host of English botanicals and other wild tastes, the innovative flavours cater to every palette – and every character! Seed and Bean have got some flavour suggestions depending on your loved ones interest and tastes! With so many incredible bars to choose from, Seed and Bean have made it a little easier for you – with a range of hampers. The lovely wicker baskets are perfect for presenting and storing your gift in a safe place. 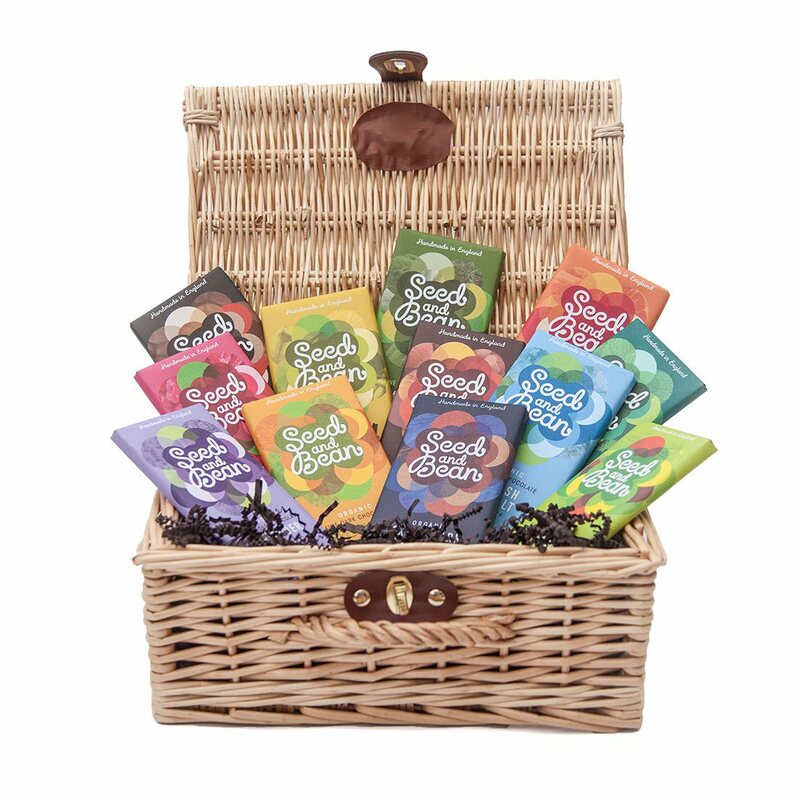 Either build-your-own basket, or select a Complete Collection Hamper, a Vegan Collection Hamper, or for the best gift ever – choose the Ultimate Hamper which features 26 sharing-size bars. Prices start at just £1.20 for a single mini-bar and work up to £75.00 for the Ultimate Hamper. Seed and Bean are, rightly, proud of their fantastic chocolate. Not only does it taste good, it looks good - and a Seed and Bean bar is also good for the planet too! They are the only chocolate brand in the UK to have been given a 100% ethical accreditation in the Ethical Company Index. Their Fairtrade, certified organic bars are wrapped in a completely recyclable packaging, including a unique fully-compostable inner foil layer. Made from eucalyptus wood pulp, the flexible cellulose film helps to keep the chocolate fresh and then naturally biodegrades on a compost heap. What’s not to love? This Valentine’s Day, Seed and Bean have everything you need to send your loved ones the perfect gift. No other chocolate tastes this good, looks this good, or makes you feel as good for taking positive steps to love our planet. You can check out Seed and Bean's full range here.